The Beaconettes at the recent Light Rail/Dark Rail performance event. Photo by Dan Bennett in the Beacon Hill Blog photo pool on Flickr. Beacon Rocks! is holding a fundraiser with a twist: the Secret Cabaret. The event will be held in a “beautiful private home” (you find out the address after you RSVP) next Saturday, June 11, at 7 p.m. Guests will be entertained by Beacon Hill performers, including the Beaconettes. There is a $10 suggested donation, and if checks are made out to Shunpike, donors will receive tax-deductible receipts. To attend (and find out the party’s location), RSVP to beaconrocks@gmail.com. The Beacon Rocks! performance events themselves this summer will be June 26, July 31, and August 28 on the Roberto Maestas Festival Street (formerly Lander) just north of Beacon Hill Station. Stay tuned for further information. Beacon Hill Music and ROCKiT Space are merging. Last year ROCKiT Space teamed up with Beacon Hill Music to bring you “Beacon Rocks!” Now we are merging to continue building programs for families on Beacon Hill. ROCKiT Space is an all-volunteer-powered arts non-profit striving to create space for community in our lives through the creative arts. We will continue to work closely with The North Beacon Hill Council; they will be a co-sponsor of all our Beacon Rocks events, generously providing permitting and insurance for those events. So “Beacon Hill Music” and “ROCKiT Space” now are interchangeable when it comes to putting on musical activities on Beacon Hill (we’ll sort out the naming as we go along). Who Is Beacon Hill Music? Beacon Hill Music is a group of Beacon Hill residents who love music and would love to see a whole lot more music (and dance) happening on Beacon Hill. We are excited about Beacon Hill having the first festival street in Seattle, the “Lander Festival Street” (the block just north of the Beacon Hill Light Rail Station). Now, as part of ROCKiT Space, we want to continue to use the Festival Street as a performance space and we are branching out to other activities such as the Beacon Hill Music Songwriters Circle, coordinating music for the Beacon Hill Festival, etc. If you have questions, suggestions, or would like to join in the fun of putting these events on, email us at beaconrocks@gmail.com. Image courtesy of NEPO House. NEPO House is presenting Encounters, another in the series of NEPO Little Treats art exhibitions. Encounters is curated by Chauney Peck and features works by Debra Baxter, Tim Cross, Matt Hilger, Jason Hirata, and Nicholas Nyland. 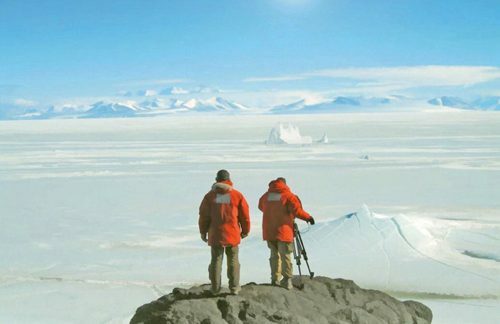 The opening event is Saturday, May 7, from 6 – 8 p.m. Apple crisp with ice cream will be served, and the event will be followed by a screening of Werner Herzog’s Encounters at the End of the World at 8 p.m. Neighbors enjoyed a Beacon Rocks! performer in August last year. Photo by Erika Warner-Court in the Beacon Hill Blog photo pool on Flickr. The first Beacon Rocks! fundraiser of 2011 swings into the Garden Club Headquarters House on Saturday, March 5 from 8 to 11 p.m. The event, billed as An Evening of Swing Dancing and Swing Era Fun, will include a live swing dancing performance and swing-dance lesson by Savoy Swing Club, a live cake raffle, and more. Hors d’ oeuvres will be free, beverages will not be—but the proceeds will go to the cause. Swing Era costumes are encouraged. Suggested donations start at $10. The Garden Club House is at 2336 15th Avenue South. The first Beacon Rocks! 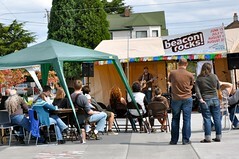 series was held last summer on Lander Festival Street next to Beacon Hill Station. For four afternoons, Beacon Hill performers entertained folks from the neighborhood and beyond with music and dance. Scheduled dates for the second Beacon Rocks! this summer are June 26, July 31, and August 28—plan ahead! Beacon Hill Music and ROCKiT Space are hosting the fundraiser, and the Savoy Swing Club Performance Troupe are donating their time as well. Speaking of ROCKit Space, the organization has relocated to the Garden Club House, and the new regular office hours are Wednesdays from 3-6 p.m.
Shunpike Arts Collective has accepted ROCKiT Space as an associate program, providing them with their 501c3 umbrella. Donations will now be fully tax deductible. There will be no open mic on March 5. Open mic at Kusina Filipina will resume the third Saturday in March on its regular schedule. Beacon Idol auditions for Beacon Rocks! will be held during Open mic nights on March 19, April 2, and April 16. Contact beaconrocks@gmail.com to schedule your audition or submit a recording for consideration. Open mics are held at Kusina Filipina, 3201 Beacon Avenue South. ROCKiT space, the music and arts community organization, has formed a board and they are working with Shunpike to continue growing as a non-profit with 501c3 status. Founder Jessie McKenna is on the board, but stepping down from the Director position for now. Betty Jean Williamson is the interim director. See the ROCKiT space website for other news and events. 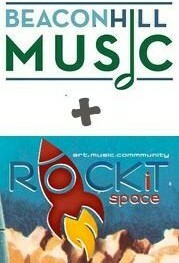 It’s looking like a Happy New Year after all for ROCKiT space and the Beacon Hill music and arts community. Betty Jean Williamson tells us that the situation for ROCKiT space has stabilized, regular hours are being staffed by committed volunteers, and the volunteer base is growing. The group is forming a board, and seeking 2-3 more members. The board will oversee a lease extension through March in the current location, and consider a long term lease. Last night ROCKiT space hosted a Tuesday Folk Night with Dan and Molly Tenenbaum and Red Dog performing to a full house. Folk night will be a regular monthly event. The next music event is Jazz Night on Saturday, January 8, 7:00 pm. Open Mic will skip January 1, and be back again January 15 at 7:00 pm. Free Create Hours are Monday, Wednesday, and Friday from 11:00 am – 6:00 pm, for all ages. This week from 3:00 – 6:00 pm there will be paper bead making. 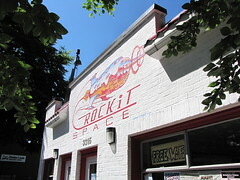 ROCKiT space is located at 3315 Beacon Avenue South.